With numerous powerful features and Add-On Modules to draw upon, we can provide a system customised for your way of working, including the ability to considerably reduce administrative tasks. Our Campaigns Module can save your staff masses of time; send forms to a specified list of email addresses and track responses as they come in – automatically sending reminders when needed. 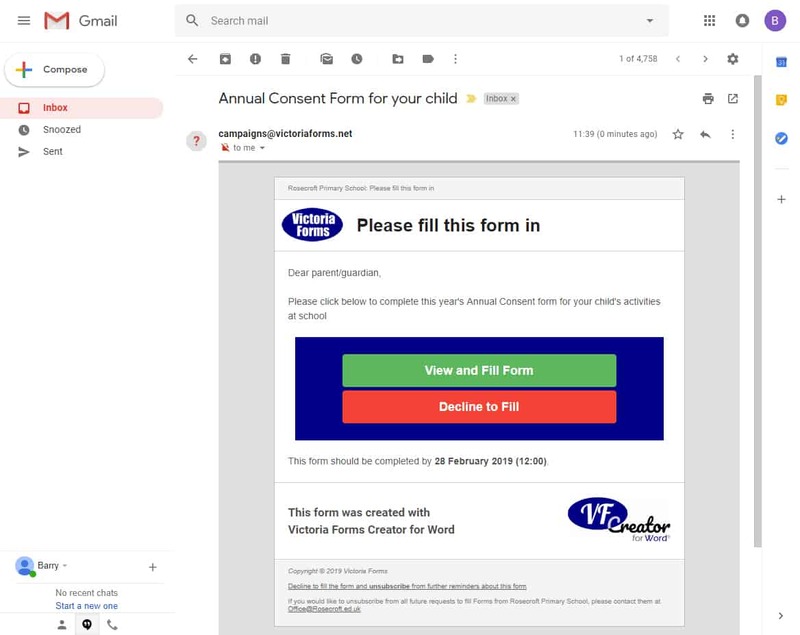 VF Creator for Word is new software that extends Microsoft Word, allowing anyone to turn existing Word documents into smart online forms. No technical skills are required, beyond a familiarity with Word. All blank, part-filled, newly submitted and archived forms are stored in Enterprise Forms Server – a secure forms management system, provided as part of the VF Creator solution. The powerful system presents, stores, and processes your forms, allowing intelligent form routing to the correct department. Enterprise Forms Server is hosted on dedicated servers in Microsoft Azure’s trusted enterprise-grade cloud computing platform. This patented software is unique – there is no other forms design software on the market that works like this. Created forms can be published to the web within minutes of completion. Responsive forms allow completion by staff, students and parents whenever and wherever it suits them. Realise considerable time savings by automating administratively taxing interactions with parents and students using our innovative Campaigns Module. Contacts on the list are then sent requests to complete a pre-populated form. You can set deadlines and pre-configure automatic reminder emails. Call to action emails take targeted users directly to the pre-populated form for completion. Keep track of completion rates from within our system and send out repeat reminders to those yet to complete the form, allowing you to avoid the traditionally time-consuming administrative tasks involved when following up on non-responses. Contact us for more information on the power of the Campaigns Module.